Our Summer Clearnace Sale Continues! We have just added some new items, such as Landmark Photos at the North Wilkesboro Shop as well as additional flags at the Elkin Shop. Be sure to stop in and browse for great deals! We are having a graduated sale! 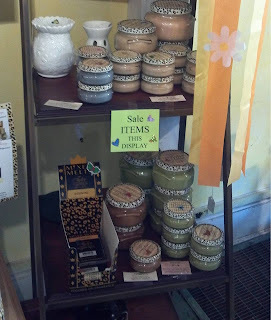 Check out our photos are just some of our sale items! We are discounting our Landmark Photos and Frames at the North Wilkesboro shop. 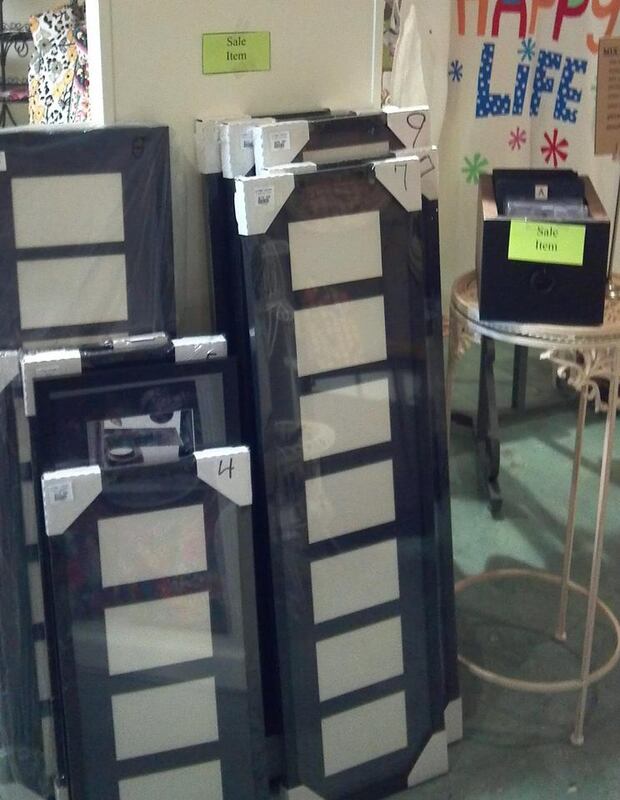 These are our black & white letters that you can spell out names and frame! 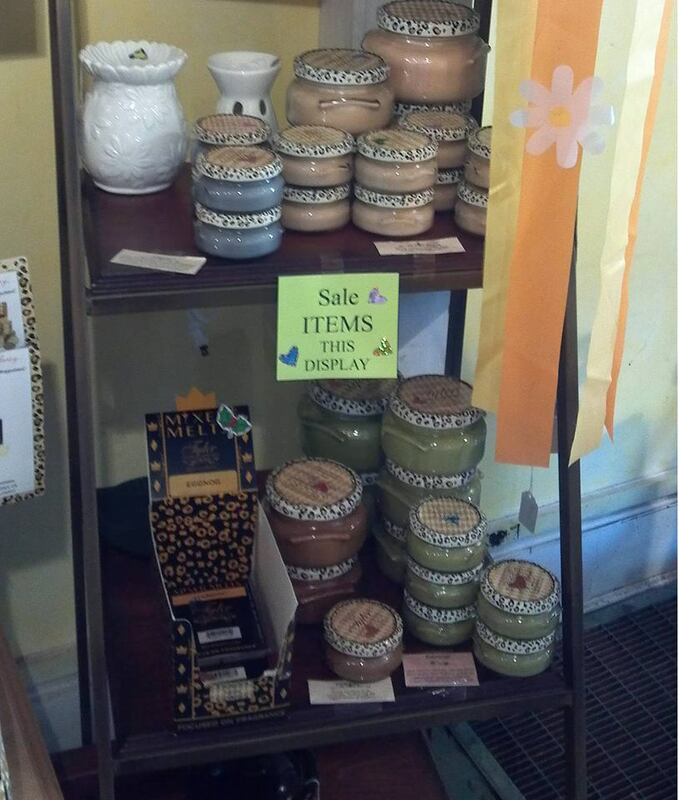 Select Tyler Candles on sale at the North Wilkesboro Shop. 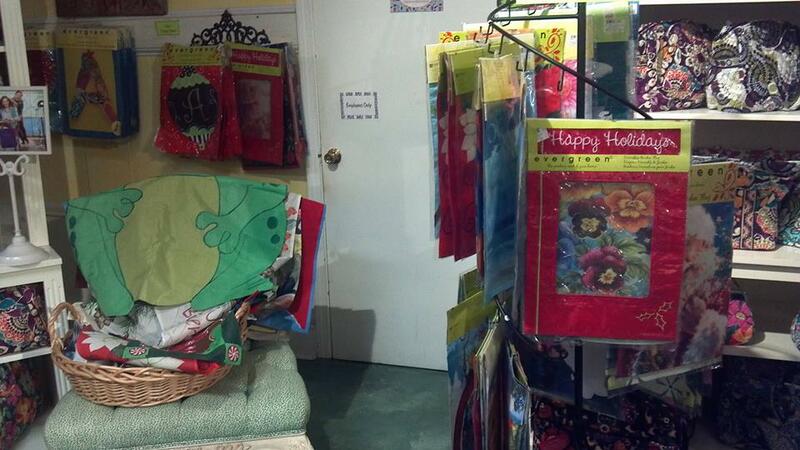 We have a large seleciton of sale flags at both shops! 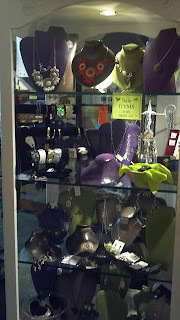 Great sale jewelry at both locations! 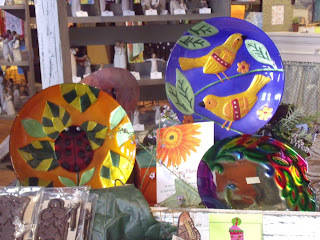 Here is a great example of our garden items. These glass-fusion plates are food-safe and can be used as a bird bath with a $12.99 stand (also on sale) if you choose. Available at both shops. 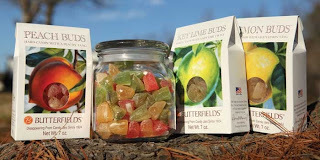 New Finds in Atlanta Coming Soon! We have been sharing photos over the last few days on Facebook from our Gift Show trip. 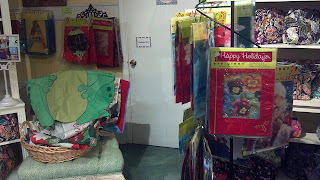 Mackenzie and I had a blast and have shared some great new items our Facebook friends. We are also going to reveal some buys that were not shown on our FB page here! Our new purchases are scheduled to arrive beginning August 15th - November 15th. If you are interested in any of the items pictured just email me at angela@ivyridge.com and we will give you a call when they arrive. 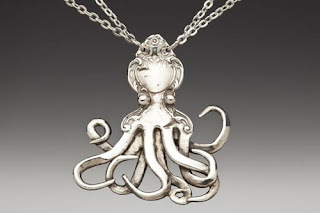 Handcrafted from vintage silverware. 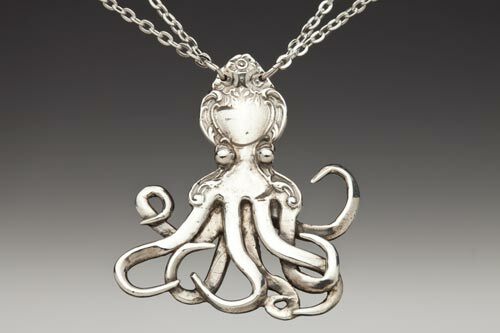 Our unique octopus necklace! 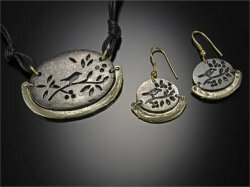 Anju Jewelry will be a great addition to Ivy Ridge with rustic artsy pieces. Keeps salads fresh for days No more brown or wilted salads to throw away. The mother-son team of Karen and Mark Graves makes Chapel Hill Toffee by hand. 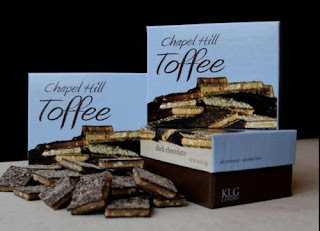 Chapel Hill Toffee is a thick layer of traditional English toffee coated on both sides with a secret blend of dark chocolates. Fresh crushed pecans add a southern twist. The toffee comes in Carolina blue packages. 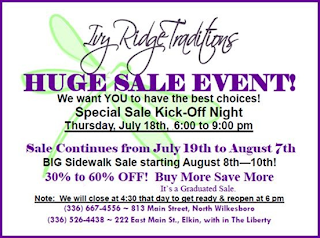 YOU ARE INVITED TO A SPECIAL SALE NIGHT ON THIS THURSDAY, JULY 18TH! We are beginning our HUGE SUMMER SALE and are inviting our Facebook Friends, Blog Followers and Email Friends to a special Thursday night preview. You get to come first for the best selection! We are closing on Thursday at 4:30pm to get ready for your visit. See details below. You are welcome to share this and bring a friend. We are having a graduated sale. (Some of our regular lines are excluded, however 60 to 70% our merchandise in the Shops will be on SALE! Sorry, no gift wrap on sale items.) Don't worry! We are only clearing our inventory to get ready to reset the shops for Fall and Christmas! 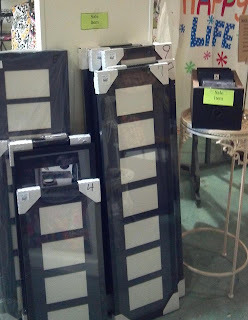 We have lots of new items arriving after our sale. 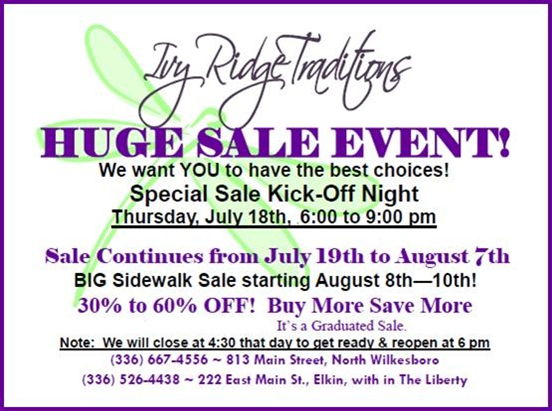 Keep in mind, we will be closing on Thursday at 4:30 p.m. and reopening at 6:00 p.m.
We are having a graduated sale.